Visit our branch in Northglenn and fill out an application during normal business hours. Monday though Friday. A minimum deposit of $5 into your savings account is required to open your account. If you have any questions about becoming a member, please call us at (303) 451-1146. 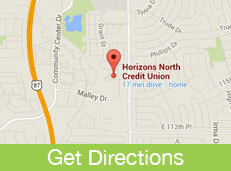 Horizons North Credit Union was founded in May of 1960 as the School District 12 Credit Union. In November of 2000 the Credit Union changed our name to Horizons North Credit Union. HNCU is a full service financial institution serving the needs of the Metro North area, the staff, parents and students of the Adams 12 Five Star Schools District, the City of Northglenn, and many other local community partners in the Metro North area. Take a look at our Products and Services Brochure. You live or work in Adams, Broomfield, or Denver Counties. Be related to anyone that works for a community partner (SEG Group). Be related to anyone who is an existing member. Join Consumers United. A one-time $5 membership fee will be charged for Consumers United, when you open your account.